Here’s a 5 second riddle for you! What do gene editing, virtual reality, artificial intelligence, augmented reality, Facebook, the internet of things and your iPhone all have in common? The common denominator of these disparate items is the integrated circuit, or as it’s commonly known today, the computer chip. Without the computer chip, none of these advances would have or could have occurred. The integrated circuit has and continues to change our world. But there’s also another commonality here, any idea what it is? It’s a social dynamic, not a physical one. 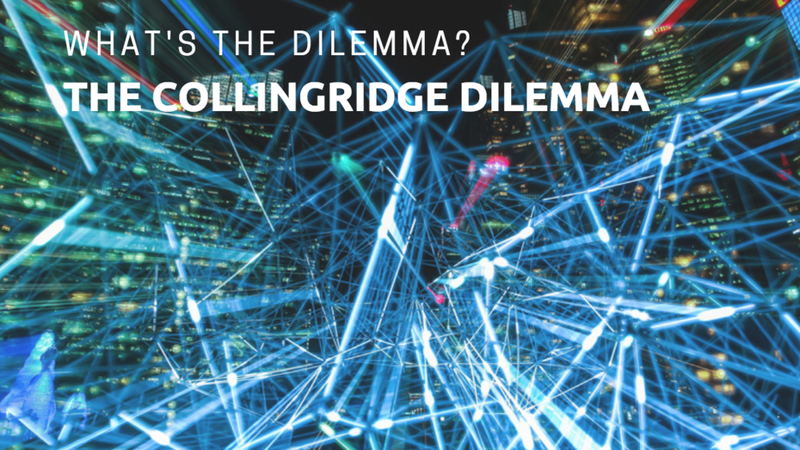 I had no idea either until a couple of years ago when I stumbled upon something called the Collingridge dilemma. Simply put, the essence of the Collingridge dilemma is that technology develops faster than society and policy makers can keep up with it. In other words, the societal implications of the technology can’t be known until the technology is developed. The end result is that policy makers have a decidedly difficult time creating policies, regulations, and laws around the technology during and after it is created. It’s almost impossible to put the genie back in the bottle under any kind of meaningful regulations as the technologies are already largely a part of our daily lives. Think about it! We don’t develop policies around future technology because we don’t know what it will be or do. And by the time the technology is fielded, it’s too late to create ideal policy controls for it because the technology has already been incorporated and/or impacted society. The speed of Collingridge dilemmas appears to be directly correlated to Moore’s law and the pace of dilemmas appears to be picking up steam. All one has to do is pick up the newspaper (or look online as print newspapers are also deeply impacted) and one can find examples of dilemmas every day. Societally, we experience the Collingridge dilemma all the time now, we’re just not always aware of it. We experienced it with Facebook and Cambridge Analytics, with in vitro fertilization clinics (largely unregulated), with embryonic stem cell research (trying to regulate it before the technology was developed). We experience it with how we shop (e-commerce versus brick & mortar - Amazon is crushing it), with digital assistants and the controversies surrounding them (deposing Amazon Echo in a murder trial to listen to recordings). And we even experienced it with Fitbits giving away the locations of troops stationed overseas. These are ALL outcomes of technological advancements that society (policy makers) did not and probably could not have predicted. They simply couldn’t envision the outcomes, at least not by using traditional means. It is my belief that the biggest issues are yet to come. With gene editing (designer babies), transhumanism and the inclusion of machine technologies in human beings (think implanted memory chips), and of course the debate around artificial intelligence in its’ purest form (existential threat to humanity of salvation?). Whatever the answers to these questions; our current methods for looking at these very real and difficult issues could use a revamp. First of all, we have to become aware that this is in fact an issue (hence this piece). If people can’t identify that there is a problem with the rate of technological policy controls compared to the rate of advancement then there will virtually be no solution. We are already divided as a society, so torn apart (at least in the U.S.) that people don’t know what to believe anymore. Unfortunately, this often leads to believing whatever is emotionally convenient, regardless of facts. But the fact is, the Collingridge dilemma is a big problem, and without our acknowledgement and acceptance, it will only get worse. Secondly, we need to get very nonlinear on how we look at these types of situations. My company, RL Leaders, takes creative minds from Hollywood (paid imagineers) matches them up with subject matter experts (SME’s) and thought leaders to collectively think in new, untraditional ways around an issue. The real key here is getting creative minds to team up with SME’s to think through the challenges, consequences, and outcomes, in order to anticipate, prevent, and solve them. It’s my belief that leaders everywhere should start taking the time to implement their own “mixed table” approach to better handle the next dilemma. There are, of course, other circumstantial approaches ranging from the political to the academic that I’d be happy to discuss directly, but admittedly some of them are nuanced. To me, this is a big set of issues that we as a society have to start calling out and wrestling with.